Way before I was born, Jack Webb played Sgt. Joe Friday on a popular tv show entitled “Dragnet”. Joe Friday’s most infamous catch phrase was “Just the facts, ma’am.” For the past 3 months we have been walking through the book of Ecclesiastes in search of answers to life’s toughest questions. As we close out our study of Ecclesiastes, we’ll be looking at ch. 11 and 12 where Solomon lays out just the facts. 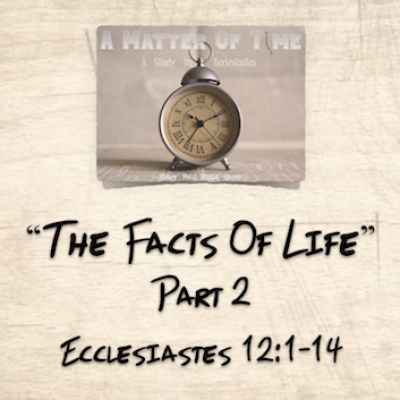 Over the next two Sundays as we wrap up our #TimeMatters series, we’ll be discussing “The Facts Of Life”.